The life of a fashion blogger is not easy when it starts getting dark at 6pm and you have a full-time job… and you leave the office at 6pm. Clearly I am not used to this mayhem, and thus have no photos of my own for you today. But, now that I know, I’m going to try to better plan in advance. Can’t it just get dark at 8pm year round? I like that better. But, I’ve been shopping a lot as usual (though not actually spending much of my own money, I’ve actually been doing pretty good this month!) 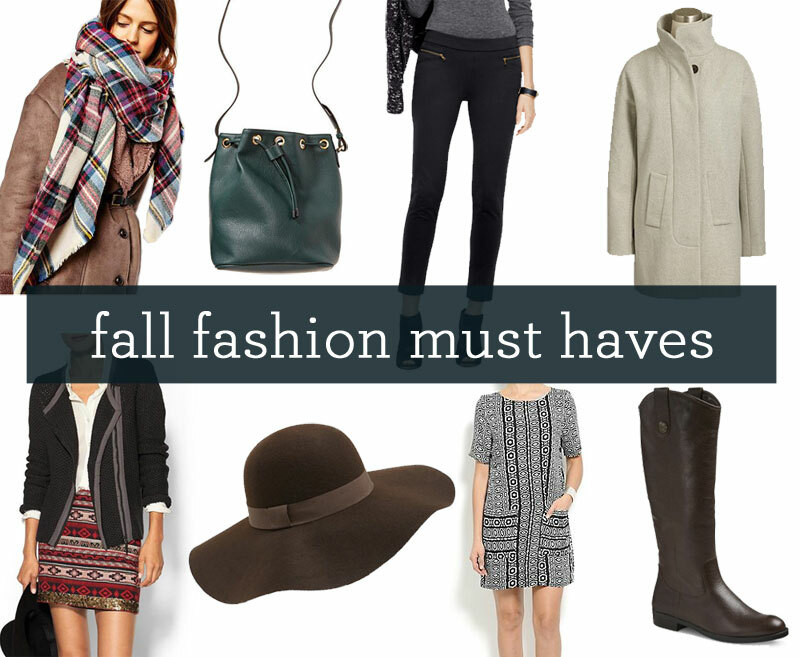 and have a round-up of some of my favorite items that really scream “FALL!” to me. I need one of those blanket scarves. So I can use it as an actual blanket. Haha, I know right? I need to use it as a blanket at work so I don’t freeze half to death! Even though I just picked the Target dupe for that scarf up yesterday, I’m finding myself tempted to purchase this one as well! What do you think of the Target version? It looks so cute online but was sold out at the Target I went to this weekend! It is soooo soft! Seriously one of the softest scarves I own. When I wore it the other day though I did find that I swallowed about a month full of fuzz throughout the day but I think that’s just because I had it bunched up really tight around my neck and it was getting caught on my sticky lipgloss. I am definetly on the lookout for a plaid scarf this fall <3 I might have to checkout those Target boots too! I don’t have any of these. I need to get some Fall shopping done. Totally – I usually am a neutrals fan for scarves but I’m really liking the bold colors. I know, I need to get back on the weekend photo shoot train, but it’s tough to work around plans and whatnot. I’m thinking I may try to get some morning photos in, may start having to get up earlier! I just ordered a Zara Dupe off Groopdealz last week for $25!! I’m so excited, so you might check to see if it is still available. You were really speaking my language today. I was just complaining how it’s been getting dark before I leave work at 6 and how it’s ALWAYS cold in my office. Thanks for sharing all the cute items. I think I NEED those leggings. I know, I’m loving those leggings too! And they basically look like pants. Love. What is it with offices being perpetually freezing?! Yes, please, all of it!! That scarf is adorable. Thank you so much for the tip on the discount code. Every little bit helps! Love the scarf and I really am so tempted by that bag! I don’t normally love synthetic bags because of the quality but I’ve heard such good things about this one! I know, me too, but after I picked up their cheap crossbody for Disneyland, I’m thinking that Old Navy’s synthetic bags aren’t bad at all! It would be so nice if it could always get dark at 8 – can we figure out a way to make that happen?! I know right? It’s so frustrating not being able to take photos after work anymore! I hadn’t seen the Asos version of the blanket scarf yet – I LOVE IT!